March 29, 1970 – The Chicago Tribune reports on new construction at 111 East Wacker Drive, beginning with the statement, “To many, the 111 E. Wacker Drive building is just another glass box or another building designed with the distinctive flair of Mies van der Rohe.” [Chicago Tribune, March 29, 1970] One of the architects on the project, Gerald Johnson, working in the office of Mies van der Rohe, quickly corrects the stereotype, saying, “This is architecture for today and tomorrow. It is clean and current and will express the 20thand the 21stcentury.” How appropriate it is, then, that this “clean and current” commercial tower standing on the south side of the river, is today the home of the Chicago Architecture Center. Johnson points out the volumetric aspects of the building with the glass at ground level giving a sense of openness and a defined formal entrance, the clear glass at this level contrasting with the tinted glass of the windows above. Gone is the symmetrical rendering of older designs. Instead, there is a regularity at work with the building’s corner columns rising up from the plaza and running all the way to the top of the building without being covered by the glass of the curtain wall. Instead of classical ornamentation or terra cotta details one sees in so many earlier Chicago buildings, there is a meticulous order in the details of the plan, a technical precision that one may not notice at first. The terrazzo squares of the floor for example, are laid in five-foot squares with the joints of the floor slabs meeting the joints of the granite wall slabs precisely and bisecting the building’s supporting columns with equal precision. 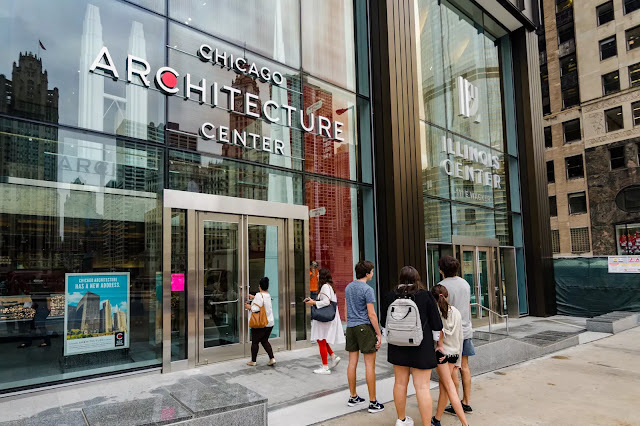 Johnson says, “There is order in the design and it makes people comfortable, whether they are aware of it or not.” Although Mies van der Rohe died in 1969, a year before 111 East Wacker Drive opened, a partner in the firm, Joseph Fujikawa oversaw its completion. It was the first building put up in the new Illinois Center development by Metropolitan Structures, Inc., the firm that descended from real estate developer Herbert Greenwald, who died in the crash of American Airlines Flight 320 on February 3, 1959 and who was responsible for a collaboration with Mies van der Rohe that did much to change the style of architecture in the city. 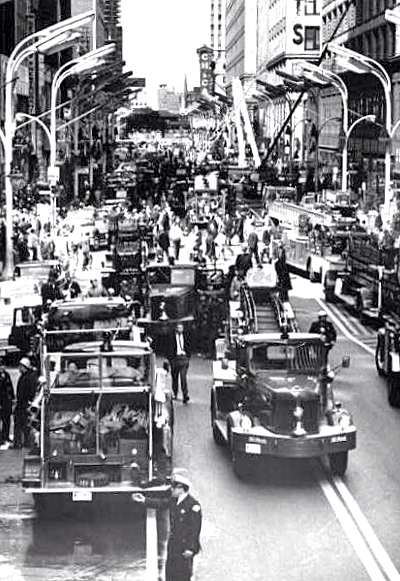 March 29, 1968 – Millions of dollars of damage is done to Carson, Pirie, Scott and Co., and minor damage to Wieboldt’s and Montgomery Ward and Co. as fires of suspicion origin call firefighters to State Street. An estimated 25,000 spectators gather at State and Madison Streets during the noon hour on a Saturday as rumors quickly spread that all of State Street is on fire. Extra alarms bring 280 firemen and more than 100 pieces of fire equipment to the area. The most serious fire at Carson’s apparently starts on the sixth floor in a department that houses art and picture frames. It quickly spreads to the seventh floor as firefighters break big windows on the sixth floor of the State Street side of the building to get water onto the flames. Fire Commissioner Quinn says that the fire suppression system on the sixth floor of the building was inoperative because of ongoing remodeling work. A Carson’s official says that losses would run into the millions, and the store would be closed until an inventory could be taken. Directly across Madison Street firefighters are able to put out the fire at Wieboldt’s with fire extinguishers. Fire equipment is moved two blocks south on State Street when a fire is next reported at Montgomery Ward’s. Windows are broken on the third and fourth floors so that firefighters can get some of the smoke out of the building. Another fire is reported at Goldblatt Brothers State Street store, but firefighters find no working fire although an employee reports that he extinguished a corner of a smoldering bedspread in the furniture department by smothering it between his thumb and forefinger. At least three firefighters are injured and require hospital treatment for smoke inhalation. Thousands of customers and employees are evacuated from Carson’s and Wieboldt’s, none of them with a stranger story that 23-year-old Pam Meyers, a Carson’s employee. She is under a hair dryer at Carson’s when everyone is ordered to leave the store. Customers at the beauty shop are taken to the Wieboldt’s salon where Meyers hears the second fire alarm of the day. Happily, she makes it on time to her wedding that evening at the Church of the Atonement. The bridegroom, Eugene Holland, shows up without his wedding suit, which is still at the Carson’s store. Carson’s and the Chicago Tribune each offer $25,000 rewards for information leading to the arrest of the parties responsible for the fires. 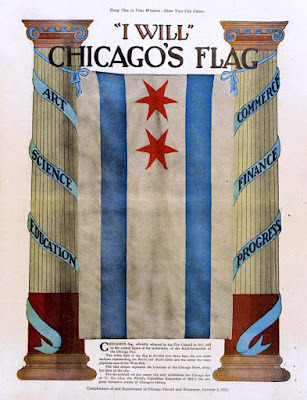 March 29, 1917 -- The Chicago City Council receives the design for a city flag, designed by Wallace Rice, and submitted by the Chicago Flag Commission. The commission describes the flag in this way: "Its uppermost stripe, of white, is eight inches broad; the second stripe of blue is nine inches; the central bar, of white is eighteen inches, and the two lower stripes correspond with the uppermost two. Near the staff on the broad white stripe are two six pointed red stars, fourteen inches tall. Viewed locally, the two blue stripes symbolize the Chicago river with its two branches and the three white bars represent the three sides of the city. The red stars stand for the Chicago fire and the World's fair [of 1893], two great influences on the city's history. The six points in the first star stand for transportation, trade, finance, industry, populousness, and healthfulness; those in the second for religion, education, aesthetics, beneficence, justice and civism. Considered nationally the blue stripes stand for the mountain ranges which flank the plain of which Chicago is the center. The central white bar stands for this plain and the two outer white bars for the Atlantic and Pacific coasts." [Chicago Tribune, March 30, 1917]. Two stars have been added to the flag since this first attempt. 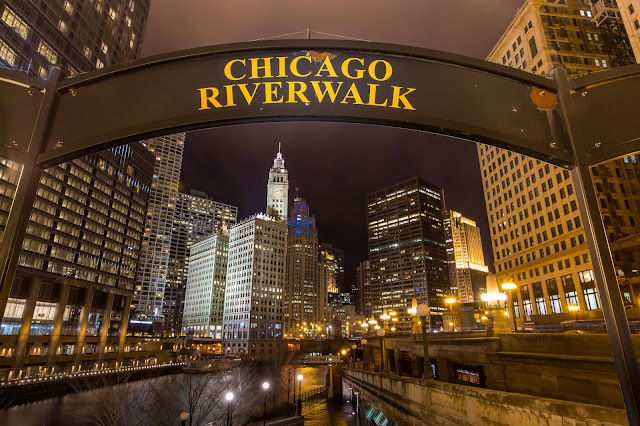 One corresponds to the establishment of Fort Dearborn in 1807; it was added in 1939. Added in 1933, the final star symbolizes the Century of Progress World's Fair, held on the lakefront in the summers of 1933 and 1934.